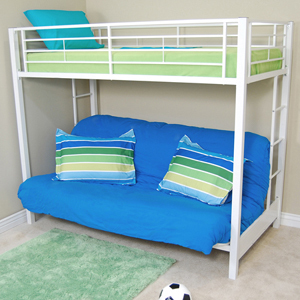 Elegance and function combine to give this contemporary bunk bed a striking appearance. The design gives a stylish modern look crafted with durable steel framing. Designed with safety in mind, the bed includes full length guardrails and a sturdy integrated ladder. Great for any space-saving design needs. Futon easily converts into a full size sleeper to accommodate an overnight guest or a growing family. This Fitted or Flat Sheet Never Needs Pressing Or Ironing. Features: Machine Washable, Wrinkle Resistant, Elastic Top And Bottom, 50% Poly-50% Cotton, Stronger Thank Cotton, Less Than 1% Shrinkage, Stays Soft And Luxurious. Thank you. We have received your feedback. Your question is pending approval. Thank you. We have received your feedback. Your review is pending approval.